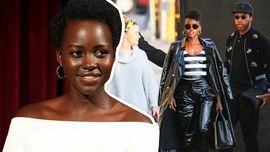 Gets Physical, Flirty with Lupita ... 'BP' Set Romance? At Least Weinstein Didn't Discriminate ... But It's Still All Bad! I've Known Lupita's Dress Was Fake ... Since Oscar Night!! Black Panther Stars Making Black Magic Together?